There are 6 different 14-bit Digitizer cards in the UF4500 range. 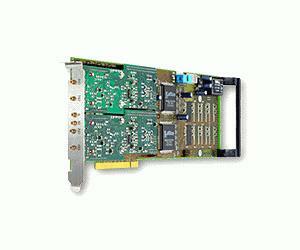 Cards are available offering 2 or 4 input channels and choice of maximum A/D sampling rates. Each channel is simultaneously sampled through independent 16-bit A/Ds and has four software selectable input ranges from ±1 V to ±10V, that can be independently set for each channel. The inputs can be configured by software for single-ended or differential termination. Spurious free dynamic range > 90 dB max.